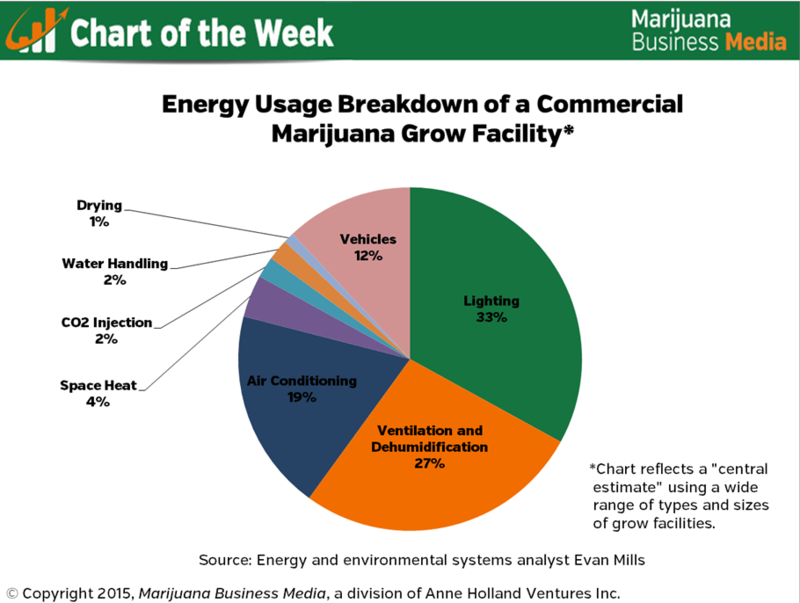 With electricity bills for marijuana grow facilities running thousands of dollars a month in some cases, understanding how energy usage breaks down is the starting point to controlling costs. Just three areas – lighting, air conditioning, and ventilation and dehumidification – comprise almost 80% of total energy costs for an average commercial marijuana grow, according to a study by Evan Mills, who has worked as an energy and environmental systems analyst for the past 30 years. And while there’s been a lot of industry focus on finding efficient lighting, which eats up 33% of total usage, there’s been less attention on other areas. With an estimated 2,000 commercial cultivation operations in the U.S. – according to the 2014 Marijuana Business Factbook – and more opening each month, pressure will be on the industry to address its energy needs. Already in Colorado, utilities provider Xcel Energy says about one half of one percent of the energy it generated last year was consumed by marijuana growers. Some industry watchers predict that if marijuana becomes legal on a federal level, clearing the way for interstate commerce, the bulk of growing will take place outdoors in climates conducive to marijuana growing. 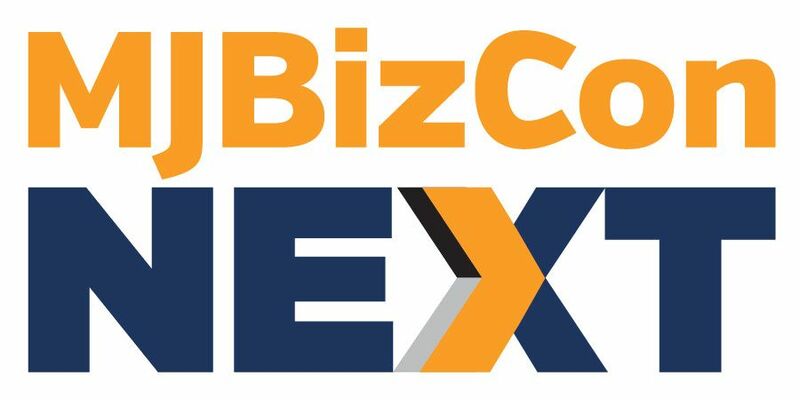 In fact, Ellis Smith, chief development officer for consulting firm American Cannabis Co., told PC Magazine late last year that he expects rising energy needs and the resulting costs will literally push the industry outside in the next eight to 12 years. How does the dropping price of fuel factor into this? At some point, it would be cheaper to run generators than to pay the increasing electric rates. Not only is electricity one of the largest cost of goods (COGs) expenses for indoor growers, here in Seattle we have to deal with seasonally adjusted electricity rates. We’re coming out with a study soon that examines these issues. Grid power is almost always cheaper and more reliable than running a generator, even at current gas prices. However, a backup supply to protect their crop in case of outages or sabotage is something to consider. Growers may be able to work with the utility to use that generator to sell power back to the grid during peak times to recoup some investment. The next question many ask is solar power. The high up front capital outlay, long payback time, and high risk makes solar very difficult to get financed. Greenhouses and outdoor grows are the likely future. Colorado Engineer has developed a resolution that saves up to 60% on power usage for the lighting industry. Local Xcel energy will also give a rebate to switch lights to Aggrow lights. Yes, there are great solutions. Precisely why LEDs are the future for indoor grows. Very little heat generated lowering costs dramatically for AC and little need for dehumidifiers. Grow in a greenhouse utilizing LED lighting from CannaPro.co, it will pay for itself in a short amount of time. Wow, better than 80% of your energy use (read: costs), is devoted to heating, cooling, and air exchange. I grow in well designed greenhouses using the sun for light, natural breezes for ventilation and temperature control. No! I am not knocking indoor growers, hardly, my hat is off to you for sustaining such nearly Herculean efforts. For over a decade I grew indoors, exclusively, and I realize just how particular you need to be to stay on-top of all the fine tunings necessary to successfully, and repeatedly grow/bloom inside…real labor of love you folks do! However, practicing good cultural controls, using great media, well documented organic foods, good clean water and ample direct sunlight every day is all you need to produce World Class cannabis…look to the Emerald Triangle Cup (only organic, only outdoor), to lead the way educating how-to’s here. Healthy, thriving plants will outgrow any and all pest issues, coupled with a strict IPM program, only while in veg!, will assure you your finished products are more than clean enough to be “medical” quality. As an example, YouTube:https://www.youtube.com/watch?v=CDCyrX4mSI4 …or, “End of Bloom Week 7” to see a recent, NorCal greenhouse harvest. Enjoy. I am looking at starting a business in the mountains in Colorado. Looking at all options currently with Greenhouse being in the forefront. Strictly looking at starting with a cultivation facility currently. I have 10 acres to play with. Thoughts, and or ideas would be greatly appreciated. MSP Technology found that in the enclosed CO2 charged growing facilities we can see electric savings up to 70% on the dehumidification side of climate control. MSP can also reclaim the water taken from the air and put it back into the plants. We have recently done a presentation for the Team Lead Energy Efficiency Engineer at Xcel Energy and his team in Colorado and they were impressed and will offer a rebate for growing facilities in Colorado. I know all will appreciate the energy savings we can provide.